235 x 155mm envelopes contain two or more sticker sheets plus bonus Zodiac Star Chart. 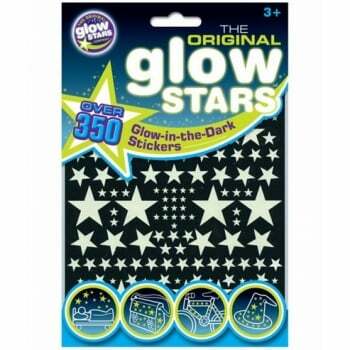 Each packet is fantastic value, crammed full with over 350 paper glow-in-the-dark stickers. You can create a magical, glowing night sky on ceilings and walls with hundreds of self-adhesive stars, moons, rockets and spaceships. Unlike plastic glowstars these Original Glowstars cannot be seen in the daylight on a white background, but come to life when the light goes out! Each sticker pack also includes a bonus Zodiac Star Chart.